Ron Horner from Earthmovers & Excavators Magazine gets to grips with one of Digga’s Bigfoot trenchers. During my operating life, I have been involved in many major infrastructure projects - both in Australia and overseas and have been fortunate to have operated most types of heavy machinery. Being born under the Zodiac Sign of ‘Lazy Bugger’ I have, mostly, tried to avoid laborious tasks such as lifting and shovelling, but there were times when I couldn’t get out of such jobs. It was during those hot, sweaty, muscle-aching and callous-creating days when I was much, much younger, that I would wonder when someone would invent something to make my life easier. Digging trenches and fence strainer post holes by hand, sweeping those massive construction concrete slabs and gutters and levelling off topsoil after some incompetent operator left more rock than topsoil for you to sort out before planting … aaaahhhh there just had to be a better way. Well, just as I dragged myself out of the trenches and into the air-conditioned cabin along comes Digga. 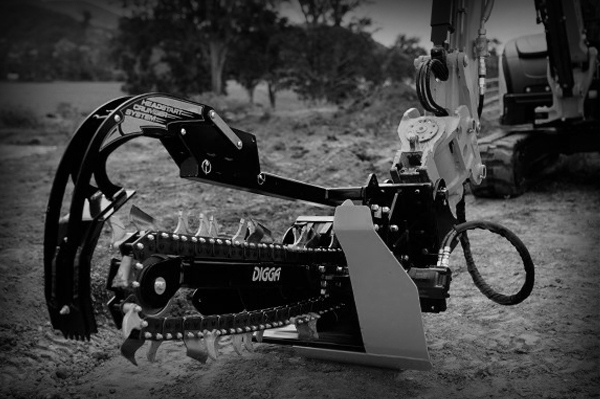 Digga is a proud Australian company based on the Gold Coast in Queensland and is a market leader in the design, fabrication and supply of buckets and attachments suitable for mini excavators and mini loaders. Recently Earthmovers & Excavators Magazine was fortunate to be invited to review Digga’s Bigfoot trencher, which is a revolutionary attachment suited to use with skid-steer loaders, backhoe loaders, telehandlers or excavators up to 8 tonnes. Having been involved with trenchers ranging from 60 tonnes to 100 tonnes in weight on many other projects during my life I thought this might be an interesting exercise. ON THE JOB - The demonstration was held in a rural setting of the Gold Coast Hinterland and was set up for me upon arrival. The trencher was mounted on a nice little 5-tonne Yanmar excavator, and the trencher complimented this size machine perfectly. The operation of the hydraulic-driven trencher attachment was simple and straightforward: click a switch to operate the Bigfoot in cutting mode and flick it the other way to send the trenching chain into reverse. There is a similar operation for the spoil removal auger which operates with excellent revolutions — the operator has to be really distracted by trenching if he is to bog down the spoil discharge side of the operation. If I have one issue with the operation of this attachment it is in the setting of the operation switch on the excavator … the operator has to have pressure contact with his hand or thumb at all times of operation. I could well imagine the complaints coming in by smoko due to the repetitive strain injury suffered merely in the first 15 minutes of operation. This could be a safety issue on both sides of the equation: the safety reps would say it is too dangerous to have the operation based on a simple on/off switch but the operator discomfort needs to be addressed as well. This in no way compromises the efficiency of the Bigfoot Trencher but I am merely questioning the set-up of the operation switches in this particular machine. When running the trencher I found production levels were excellent for a machine of this size. The material excavated was predominantly clay base type material with the odd rock thrown in to make sure I didn’t get too comfortable. To operate the trencher attachment on the excavator, the operator has to work in reverse. This means you need to make sure you have a wide cleared work area, keep pedestrians well away, use a spotter and create a well-defined trench line prior to starting the excavation. The operator has to make sure that the operation is smooth and not use the trencher attachment as a ripper by attempting to move too fast, just let the trencher define the speed of the operation and adjust the excavator to suit. The excavator in this particular setting is purely providing the motive power for the trencher. SOLID BUILD - The Digga Bigfoot trencher’s features include an adjustable depth skid foot which is quite visible from the operator’s cabin and has pre-set digging depths of 600mm, 750mm and 900mm, and a heavy-duty crumber with a steel scraper shoe. You can start trenching with the crumber in the ground. What impressed me most, though, was the adoption of the new barrel and spoil auger for discharging trench spoil from the edge to the side of the excavation. When you are digging deeper you definitely don’t want that spoil fouling your bed so this is a great innovation which works superbly. Digga also makes a Mini Bigfoot, which suits machines up to 1.5 tonnes and can dig to depths of 450mm, 600mm, 750mm and 900mm, and a Bigfoot XD, which can be put onto machines up to 8 tonnes and has pre-set depths of between 450mm and 1200mm for standard-flow machines and 600mm to 1500mm for high-flow machines. Three optional chains are available for totally different soil conditions — Earth, Combination and Tungsten, or ‘Diggatac’. The Earth chain, which is suitable for softer soil, preferably free of floaters or tree roots, has a ‘cup tooth’ affixed to every second station on the chain. The Combination chain is more suited for general-purpose use and cuts through hard soils, roots, soft shale and some rocky ground. This chain is manufactured with a combination of earth cup teeth and tungsten teeth. Finally, the ‘Diggatac chain’ commands total respect as it is suited for rocky hard shale, asphalt and frozen ground conditions … not much frozen ground here above the 26-degree parallel but you get the idea of its capabilities. THE BOTTOM LINE - The bottom line on the Digga Bigfoot chain trencher is that it provides the small machinery industry with the opportunity to expand on the capabilities of their equipment, thereby enhancing the opportunities of hire. If you are a contractor, you know that this equates to increasing your business turnover and cash flow. The attachment also provides an efficient and cost effective outcome for your project, which also equates to budget and time savings for the client. If you understand those facts, you have created a perfect win-win situation where you exit the job knowing 'happy boss … minimal loss'. The bottom line on Digga itself is that this is a brilliant, award-winning Australian company where the directors have instilled an extremely high level of service by developing a close and personal relationship with its workers, clients, suppliers and distributors based on mutual respect, loyalty and consideration. Affordable attachments designed, built and sold out of the one Australian factory, ready access to affordable spare parts, an innovative and supportive engineering department and a company open to modify the stock items to suit a customer’s specific requirements … I thought this type of company had disappeared many years ago. For further information on Bigfoot trenchers, call Digga on 1300 2 DIGGA. To view the full article on the Tradeearthmovers website, follow this link: Review: Digga Bigfoot Trencher.